Add a side of creamed spinach and you’ve got the classic steakhouse entrée with a bistro twist! Steakhouses have commercial equipment that cranks out the BTUs for high, high heat, but you can achieve a charry exterior and tender, juicy interior by heating your grill very hot. To do so, heat with the lid closed. Then grill the steaks with the lid closed except for when you turn the steaks. Use a mandoline slicer for paper-thin onion slivers. You can fry the onion slivers earlier in the day and simply warm the slivers in a 350°F (180°C) oven, uncovered on a baking sheet, for about 10 minutes or until warmed through. 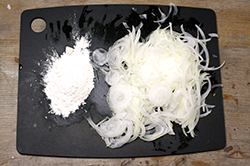 For the Fried Onion Slivers, toss the onion in flour until well coated. 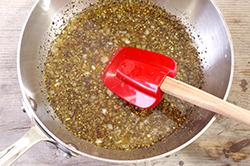 In a deep saucepan or an electric skillet, heat the peanut oil over medium heat until it registers 350°F (180° C) on a candy or deep-fry thermometer. Add the onion, in batches, and fry, stirring frequently, for 7 to 8 minutes, or until golden. Remove with a slotted spoon to a plate lined with paper towels. Season with salt. Set aside and keep warm. 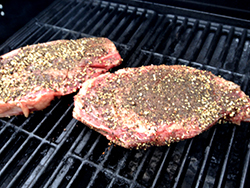 Brush the steaks with olive oil and sprinkle the peppercorn rub and the salt on both sides, pressing it into the steak. 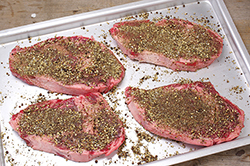 Grill for 2 to 3 minutes per side, with the grill lid closed, turning once, until charred with good grill marks on the outside and a meat thermometer inserted in the thickest part of a steak registers 130°F (50°C) for medium rare, or until desired doneness. 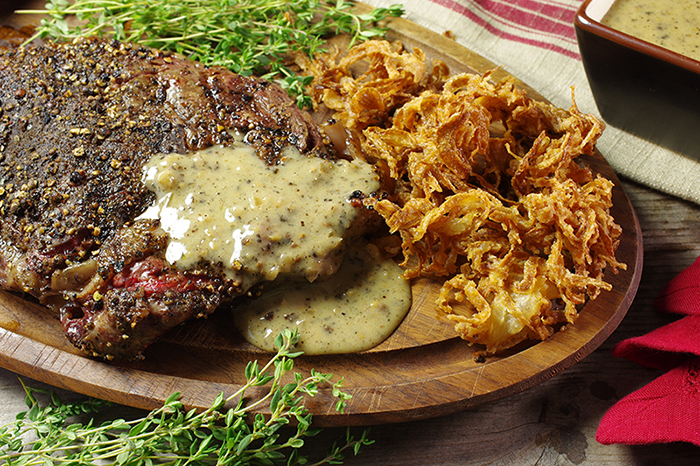 Serve the steaks with a side of the onion straws and spoon the Three-Peppercorn Beurre Blanc generously over the steaks. 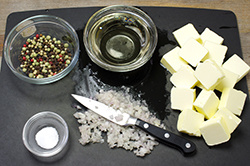 Peppercorns in three different colors and flavors mean three times the flavor in this rub, which is delicious on the classic steak au poivre. 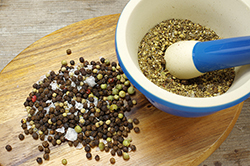 You’ll need a mortar and pestle (or clean dish towel and a heavy meat mallet) to crack but not completely grind the toasted peppercorns. 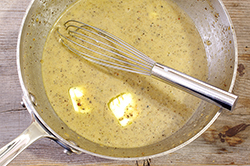 For an even greater hit of peppercorn, serve grilled beef, salmon, or tuna steaks with this rub, accompanied by Three-Peppercorn Beurre Blanc (see below). Place all the ingredients in a small cast-iron skillet over medium-high heat and toast, stirring frequently, until the spices become aromatic, about 2 minutes. Scrape the mixture into a mortar and grind it with a pestle until crushed and still somewhat coarse. Use right away. Sprinkle foods destined for the grill with Three-Peppercorn Rub (as above), then serve this sauce as an accompaniment for a welcome culinary heat. 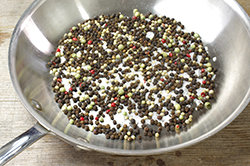 Place all the peppercorns in a small cast-iron skillet over medium-heat and toast, stirring frequently, until aromatic, about 2 minutes. Scrape into a mortar and grind with pestle until crushed but still somewhat coarse. In a small saucepan, bring the crushed peppercorns, wine, and shallot to a boil. Continue to boil until reduced to 2 tablespoons, 10 to 15 minutes. Remove the pan from the heat and turn the heat to low. Whisk in 2 cubes of butter, then return the pan to the heat. Whisk until the butter has almost melted into the liquid. Continue whisking the butter, one cube at a time, until all the butter has been emulsified into the sauce and the sauce has thickened. Remove from the heat immediately and whisk in the salt. Keep warm in the top of a double boiler or transfer to a stainless steel bowl and set over a pan of hot, not boiling, water until ready to serve. Reprinted with permission from BBQ Bistro, Simple, Sophisticated French Recipes for Your Grill by Karen Adler & Judith Fertig. Copyright 2015. Published by Running Press, Philadelphia, PA. All rights reserved.